bppa advises and serves both foreign clients with legal affairs in Austria and domestic clients abroad throughout the whole of Europe. A network of selected partners across the EU ensures the same standard of representation applies abroad as for bppa within Austria. This standard is guaranteed by the fact that the primary responsibility for the respective international case remains with bppa. 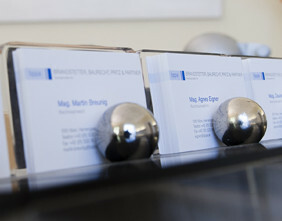 bppa is a member of the international lawyers' professional organisations DACH and AIJA. Timely resolution of both domestic and international cases. bppa has a long history of cooperation with Lavrynovych & Partner, one of the largest law firms in Ukraine.